How Safe Is Your Face From The Barber? A UK View! You are here: Home / Shaving / How Safe Is Your Face From The Barber? Part 3: A UK View! How Safe Is Your Face From The Barber? Part 3: A UK View! As a traditional barber in the UK who first learned the art of straight or ‘cut-throat’ razor shaving in excess of thirty years ago, I have seen many changes to the way in which it is exposed to the paying public – and not for the better either! I learned the noble art in the days when you were expected to learn all aspects of it, as well as every other aspect of barbering, as part of a five (5) year ‘contracted’ learning period which consisted of a three (3) year indentureship (apprenticeship) followed by a further two (2) years as an ‘Improver’. Whilst this will seem an awful long time to today’s youngsters, it really did allow for a thorough training and a progressive build-up of the necessary knowledge and experience needed to become proficient in all aspects of the trade, most certainly including wet shaving. I don’t know about the USA, but here in the UK in the last couple of decades we have in my opinion, dramatically dropped our standards as far as appropriate training in the trade is concerned (this appears to be the case with all trades sadly). With many now being awarded ‘certificates’ after as little as twelve (12) weeks training, it is hardly surprising that standards have dropped. Indeed, some barbers are now specialising in 1, 2 and 3 day ‘shaving courses’ which purports to train employees sufficiently in order to start straight razor shaving as part of the services offered within their shop. The arguments for and against such ‘training’ is no doubt for another discussion but, in my opinion, such clearly insufficient training, and perhaps more importantly experience, has undoubtedly led to the decline in quality of the ‘traditional’ barber here in the UK. The “horror story” from Kenny (tattooyu) about his experience with a recent visit to a ‘barbershop’ for his first wet shave as posted on sharpologist.com is perhaps a case in point and perhaps goes some way to suggest that a similar problem exists in the USA too. Kenny’s comments can be seen here. I have to say that, professionally, Kenny’s woeful tale leaves me saddened but, alas, not at all surprised due to the modern obsession with ‘cashing in’ on what should be a dedicated art. Far too many ‘Male Grooming’ parlours are springing up, mainly employing hairdressers masquerading as barbers and with the sole intention of making lots of money from the undoubted sharp rise in the modern male grooming industry. In my opinion, they ‘cheapen’ the long-standing and well deserved reputation of the authentic traditional Barber who has spent many years honing and improving on his skills picked up over many years of experience. So then, let’s ask some questions that may be pertinent to a gents visit to a barbershop for a traditional wet shave. What should a customer expect? The very least that any customer who pays good money for a wet shave should expect is to be attended to by a professionally trained and competent barber who has sufficient expertise and experience to carry out a comfortable, safe and ultimately relaxing procedure using a ‘cut-throat’ or open razor. When I shave my customers, particularly if it’s their first visit, I take time to help relax them by talking to them about correct shaving technique, something that they can take away from the experience and put into practice at home when they shave. It’s a simple fact that, in my experience, the vast majority of gents do not shave correctly. This is due to two main reasons: 1/ who teaches a guy how to shave? Most are ‘self-taught’. 2/ Men can take the lead from adverts which are extremely misleading, unattainable and just plain wrong! I want my customers to leave my shop feeling relaxed, pampered and already looking forward to returning for their next shave. I notice with interest that many barbers in the USA charge similar prices for their shaving service as they do for haircutting. This is not generally the case in the UK and certainly not for me. I charge over double the price of a ‘standard’ cut for one of my shaves. Yes, there are additional costs involved for me (hot towel steriliser, shaving oil, soap/cream, balm, etc) but the first and foremost reason I charge what I do for one of my shaves is the simple fact that customers are primarily paying for my expertise. What questions should a customer ask before their shave? In my experience, most gents who are being shaved for the first time don’t really know what to ask and those familiar with the process don’t really see the need to ask questions. However, I tend to start the process by asking them some questions about their shaving regime. Once the conversation has been initiated, most will then open up a little. With that said, gents who have the undivided attention of an experienced and fully competent barber should take full advantage of the opportunity by asking for advice on how best he should shave correctly, with his own skin type and beard growth in mind. What kind of information should a customer convey to the barber? In my experience, there are two types of customer when it comes to shaving – those who want to talk through their shave and those who just want to relax and, in many cases, fall asleep. However, a customer should advise the barber of any particular allergies he has which would have a direct impact on the type of products used for the shave. As an example, someone with a nut allergy would not want a product used that contained, for instance, sweet almond which could be an ingredient in a pre-shave/shaving oil. He could also advise of any particular sensitive areas of his beard which the barber should be aware of. What attitude should a barber have towards his customer? First and foremost, an attitude of respect, patience and a desire to give the customer an experience that he will want to repeat again and again. A good barber would also take the opportunity to help the customer improve on his own shaving routine by offering advice on improved technique and suitable products for his particular skin type. Should customers be disappointed if the barber uses a cartridge razor to accomplish the shave? Absolutely! Unless by prior arrangement by way of tuition, a wet shave at any authentic, traditional barbershop should always be undertaken using a ‘cut throat’ or open razor. If you book into a barbers for a ‘professional’ shave and arrive to discover that a cartridge razor will be used – walk out – or better still, ask before you book the shave. The shave is obviously being undertaken by someone who is NOT competent enough to offer you a ‘real’ barbershop shave but who simply wants to cash in on the current resurgence in the wet shaving experience! In conclusion then, experiences like the one Kenny suffered simply would not happen if you do your homework before booking an appointment. Any professional barber who is competent in the art of wet shaving will not be offended if you ask questions as to his experience and expertise. A well executed open razor shave is, for me, the ultimate experience in male grooming. Therefore, if you find a barber who has the knowledge, expertise and skill to let you experience it, truly enjoy it – for it is sadly a dying art! Thanks for your comment Donna! Certainly here in the UK, the “decline”, when it comes to hot towel shaves, is in the Quality and not the Quantity. There are more and more “Male Grooming” parlours opening up all the time. Sadly, their operatives have had 1, 2 or 3 days training – hence the rapid decline in the quality of the ‘time-honoured’ barbershop shave. I’m an American barber of sixteen years and I do not recommend hot towel shaves at all. There’s a reason why barbershop shaves have declined, its called a “disposable razor”. A single edge straight razor is clearly inferior to todays tri/quad blades. I’ve never received a proper close shave in any barbershop and I have yet to see a barbershop shave that can match what you can do yourself in the comfort of your own home. A shave can be a relaxing experience if done properly. However, the shave itself is no where near as good as doing it yourself with a disposable. I have to say that I am both slightly surprised and saddened by your professional opinion. Whilst I accept that ‘multi-blade’ razors are, by far, the most common form of razor bought by the average gent, I am convinced that such razors play a major role in the shaving problems experienced by their users – and I’ll tell you why. The bottom line when shaving Chris is; you are scraping a sharpened piece of metal across your skin – you are going to cause damage to the skin. The key to a successful wetshave is to cause the minimum amount of damage when executing the shave and then to quickly repair any damage after the shave. Now, if you take that analogy, “you’re scraping a sharpened piece of metal across your face – you’re going to cause damage”, what are you doing when you ‘scrape 2, 3, 4, 5 or 6 ‘blades’ across your skin? Answer: 2, 3, 4, 5 or 6 times the damage! There is plenty of dermatological evidence to support this claim – as well as the claim that such ‘multi-blade’ systems also play a major role in contributing to excessive razor rash and in-grown hair syndrome. A well executed ‘open-razor’ shave, which only utilises the one (1) blade, is actually far kinder to your skin whilst producing equally as good if not better results (in the right hands) than any cartridge razor. Where a large percentage of the problem with ‘Barbershop’ shaves lays Chris, is in the modern obsession with “training” such ‘barbers’ in only one (1), two (2) or three (3) days?! In other words, the recent upsurge in ‘Male Grooming Parlours’ has seen some in our ‘trade’ cash in on the very lucrative business of charging a lot of money to those who, although not trained barbers, see a very lucrative market that they can exploit to their great financial gain! In conclusion Chris, and at the risk of repeating myself, if you have never experienced a relaxing ‘wetshave’ from a TRUE professional and experienced barber, you really should do yourself a favour – before it is too late! Personally, if I’m paying good money, I’d be looking for more than just a “decent shop shave” – I’d be expecting a professional, comfortable and relaxing experience by someone confident and proficient enough to deliver all of the above! Thanks for your comment Darren! There is a fine line between offering a quality, ‘unrushed’ service and being ‘pedantic’. A properly trained and experienced barber will always strike that balance. Of course, being fully confident in your ability to perform in all the various aspects of traditional barbering is paramount to that ‘service’! You are also correct in that we, certainly here in the UK, have far too many ‘hairdressers’ masquerading as barbers and even more so these days as they see the sharp rise in the mushrooming ‘male grooming’ market. Particularly is that the case when it comes to, as they see it, the lucrative ‘service’ of ‘open-razor’ shaving, with many ‘barbers’ only too happy to ‘cash in’ on the even more lucrative ‘service’ of ‘teaching’ them – often in only 1, 2 or 3 days of ‘tuition’?! It’s a fact Darren, if any guy finds a truly ‘traditional’ and experienced barber these days – enjoy them, for they are a dying breed indeed sadly! I wish there were more barbers like you. I’m dismayed by the amount of hairdressers posing as barbers. I’ve no disrespect for stylists, but when I and many other men go to a barbershop we expect to be served by qualified barbers who can give us a short back and sides within a reasonable amount of time. I went into a “barber shop” at the weekend and it took over 20 minutes to get a number 2 and a trim on top, and my hair is thinning so there wasn’t a lot to cut in the first place! Another man was being seen to 15 minutes before my haircut started and he was still there 1o minutes after I had finished. I’ve heard of attention to detail but that was ridiculous, I think the “barber” stopped short of taking out a ruler to measure each individual hair. Thanks for your comments Johnny and I’m glad you liked the piece. You would be made more than welcome at VB HQ my friend so get a double lottery ticket this week!! This has been a most enjoyable read and I could not agree with you more. The last good barber shave I had was almost 15-years ago just before my old lifelong barber passed away. The local beauty schools around here (and that’s what they are, beauty schools, not barber schools) don’t even teach shaving. If I ever win the lottery, I will buy a plane ticket just to come over and visit your shop. Thanks for the compliment Angus! I am not aware of any database or website which would routinely carry the information you requested. The best way of finding out where is best for a professional barbershop shave is by word of mouth and searching the local forums. In fact, I’d be interested to know if you do find one as I would pay it a visit the next time I’m ‘up the road’! This is a great article! I completely agree about the shortening of these qualifications. I was just wondering, is there any site or database with a list of those “old school” professionally trained barbers in a given area? I live in Glasgow and have had a couple of SR shaves that have somewhat disappointing and would like to know where I should be guaranteed a good shave! 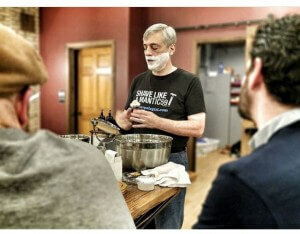 From a barbering point of view, I would say that a well executed facial treatment prior to a shave is a great idea. A gentle facial will warm and relax the approximately 30 muscles evident in our face due to the massage effect. However, you are quite right to point out the exfoliating process – the removal of dead and damaged skin cells by means of an abrasive action – as ‘over-exfoliating’ can not only remove ‘debris’ from the epidermis (the outer layer of skin) but also reach through to the healthier skin of the dermis (the 2nd layer of skin) and even, in exceptional cases of ‘over-exfoliating’, penetrate down to and damage the subcutaneous tissue. Bearing in mind that the very action of shaving – the circular action of a badger/boar brush on the beard as well as the action of scraping a sharpened piece of steel across the skin – in itself exfoliates the skin, it is my opinion, a gentle facial without the use of a defoliant, would be perfectly acceptable as a pamper session prior to shaving. As an added precaution, I would advocate the use of a quality shaving oil prior to the shave which will give added protection, moisture and glide. I would like to know if it is wrong to give a shave and facial on the same day? I have heard it helps to soften the beard more, as long as they do not exfoilate. True? Thanks for the encouraging words Chopper! If you ever find yourself up this neck of the woods …………! “…many of my customers fall asleep whilst I shave them – you have to be completely relaxed to do that…” VB, I almost spilled my coffee laughing at that comment. Yes, one MUST be relaxed to sleep while someone has a go at them with an open razor. I will probably never get a chance to come to the UK and experience one of your shaves. But, I salute you for your dedication to preserving and fostering traditional techniques and VALUES. Thank you sir. It’s interesting that some who come to me for their first ever ‘cut-throat’ shave are very nervous initially. I remember one gent who was so nervous (his wife had bought him a gift voucher) that he was actually forgetting to breathe! I had to stop periodically and let him catch his breath! Suffice to say, he loved it by the end and had relaxed sufficiently enough to breathe without prompting! Falling asleep would take a few more visits for that particular gent!! Reading this article could well have been a godsend for me…. I have suffered for over a decade with horrendous razor bumps and ingrown hairs. It was embarrassing and I had little or no confidence, I did not want my photograph taken and I was convinced people didn’t want their photograph taken with me!! I have tried many different ways to shave and to try to overcome the problem…. – Switching from a 3 blade to an electric shaver – not a good move for my neck. – Using topical creams prescribed by GP – nothing happened. – Using an American depilatory powder – these gave me terrible chemical burns. The tins of powder ‘magically’ disappeared into the bin! – Using ingrown hair treatments in blue and gold bottles which would sting my face but did little else. – Various other soaps, creams, lotions and potions. – Staring a course of laser treatment – Ouch! Both for my skin and my wallet! That did not last long at all. I am fully aware that many of these products and treatments would work wonders for others but sadly they did nothing for me and my neck still resembled what can only be described as ‘corned beef’. After discovering Mantic59’s videos on YouTube a couple of years ago I decided to change to ‘old school’ traditional shaving. Some things I had found useful after watching these videos were purchasing a single blade razor and using a brush and soap to apply a good lather. I thought I’d come up ‘trumps’. Things improved but I was still suffering from a rash. It was no longer painful or weeping but it was still visible and looked quite raw. As there was no pain I thought this was the best a man like me could get, so I continued on with life. The other day, I received my Sharpologist email about the article above. Reading through the article and looking at Iain’s website I thought I’d get in touch and ask about my shaving issues, if he had any tips and if he thought his products would be a good option for me. After a little hesitation , I’ve been caught out before when buying new products, I made my purchase. They arrived today and I used both the oil and balm for a shave. Both products have a great aroma, I can’t quite place it but it’s very pleasant. The oil went on nicely and it helped me see what I was doing. My beard just seemed to come off effortlessly. Only a few cuts on some bumps already on my neck but all in all a very comfortable shave. Then applying the balm did really make my face feel different and smooth. It’s a few hours since my shave and normally my neck would look red and angry. Now it doesn’t. This is something that has never happened to me before. It looks normal. There are a few bumps that were there this morning, I wasn’t expecting them to disappear after one shave but there is no redness what so ever. Obviously after one shave I can’t really tell how things will pan out but they certainly seen very different at the moment. Just comfortable. Time will tell, and I will keep people posted. Iain was very helpful in his emails, delivery was very fast and his products seem to be doing the trick. I’d just like to take this opportunity to thank Iain for his time and if you are suffering like I have been give his products a try. Thanks Andy for your encouraging comments! I always get great satisfaction when guys like you get relief from their shaving ills. Do as you say, keep us informed as to how your skin condition improves!! Great article VB. I followed the link to your website and saw it takes 40 minutes for one of your shaves. I’m sure it’s an experience but how so long? I’ve had a few barber shave experiences usually taking around 10 minutes (cut throat but no pre toweling). Thanks for your comments Josh. It was drummed into me as an apprentice, over 30 years ago now, that a guys visit to the barbers should be about more than just a haircut or shave. It should be an ‘experience’ whereby they walk out of your shop feeling relaxed, perhaps even pampered and having enjoyed their visit. Indeed, many of my regular customers have commented on the fact that they simply don’t receive the attention to detail I provide anywhere else. Can I perform a ‘cut-throat’ shave in 10 minutes? By all means! Would I want to? Absolutely not! Why? Simply because, as I’ve alluded to above, that would hardly give the customer time to relax far less feel pampered! You see Josh, for me a barbershop shave should be about more than just leaving with the appearance of being’clean shaven’. You can accomplish that on your own at home. Therefore, my customers enjoy a completely relaxing atmosphere where nothing is rushed (depending on the beard, I can take up to 10 minutes simply preparing the skin for the first pass! ), relaxing hot towels are used and my Shaving Oil is given time to really get to work on the skin. As stated in my piece, many of my customers fall asleep whilst I shave them – you have to be completely relaxed to do that and I for one don’t think that can be accomplished in only 10 minutes! I wish I lived within easy reach of County Durham! The shave you describe is exactly the type of experience I would like to pay money for. Sadly Staines is a bit more than a stones throw from there. I have a great relationship with my barbers – but they are hair-cutters, not shavers and why would I pay money for a 10 minute whip around with a shavette when I can achieve better results using better products at home? Anyway, great article and very useful – particularly with regards to the questions I should ask. Great to see this article. I’ve been visting Iain’s barbershop regularly over the past few years for haircuts and the occasional treat of a ‘proper’ cut-throat shave. Thanks to Iain’s shaving tips, and in particular his comments on the (somewhat random) way that my own beard grows, I now have no problems at all with razor rash or irritation. I also thoroughly recommend his own oil and balm – smoooth! Somewhere along the line the art of proper shaving, even at home, seems to have been lost to mainstream society. Ridiculous marketing claims for razors with multiple blades and celebrity endorsement of alcohol-based gels and foams don’t help. Yes, I suppose I am ‘old school’ when it comes to all things barbering – and I’m proud of it! Traditional barbering and all that that encompasses is sadly, as mentioned in my piece, a dying art! I intend to write more for Sharpology and indeed for my own new website which should be launched next month! Thanks again for your kind remarks Chris and Happy Shaving!